The colors of the season are evoked in our Cardinal Joy Mini Banner, a scene drawn from nature. Let this counted cross stitch banner set the tone for your holiday decorating. Kit contains presorted cotton thread, 14 count ivory cotton Aida, wire hanger, jingle bells, needle, and easy instructions. Finished Size: 5" x 10" (13 x 25 cm). Designer: Anita Phillips. © Anita Phillips & Sagebrush Fine Art..
Rich shades of cotton thread are used to create the Fall Mini Banner by Dimensions. Display this charming counted cross stitch design all season long. Finished size: 5" x 8" (12,5 cm x 20,5 cm). Designed by Debbie Mumm. © Debbie Mumm. Counted cross stitch kit includes: Presorted cotton thread, 14 count ivory Aida, Wire hanger, Needle, Easy instructions..
Say hello to blooming flowers and chirping birds with this sweet Spring Mini Banner in counted cross stitch. This charming design from Dimensions is perfect for gift-giving. Finished size: 5" x 8" (12,5 cm x 23 cm). Designed by Debbie Mumm. © Debbie Mumm. Counted cross stitch kit includes: Presorted cotton thread, 14 count ivory Aida, Wire hanger, Needle, Easy instructions.. Celebrate summertime with happy frogs, beautiful blossoms, and warm sunshine. 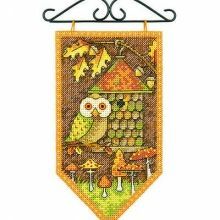 Display this cute counted cross stitch Summer Mini Banner from Dimensions all season long. Finished size: 5" x 8". Designed by Debbie Mumm. © Debbie Mumm. Counted cross stitch kit includes: • Presorted cotton thread • 14 count light blue Aida • Wire hanger • Needle • Easy instructions..
Santa's ready to spread some Christmas cheer. The charming Winter Mini Banner by Dimensions is worked in counted cross stitch. Finished size: 5" x 8". Designed by Debbie Mumm. © Debbie Mumm. Counted cross stitch kit includes: • Presorted cotton thread • 14 count black Aida • Wire hanger • Needle • Easy instructions..